The two church schools with in our group of churches are now working in partnership together under the Headship of Mrs Gardener (previous head of Sandringham and West Newton school). She will be dividing her time between the two schools. Both schools are always happy to receive enquiries from prospective parents. More details can be found on the links below. Both schools regularly attend services in their local church, as can be seen from the photos below. Flitcham School offers a nursery facility for children aged 3 and 4 years old. Please click on Flitcham Fledglings for further details. Sandringham and West Newton School and Flitcham School. Sandringham and West Newton school after their annual Mothering Service prior to clypping the church. 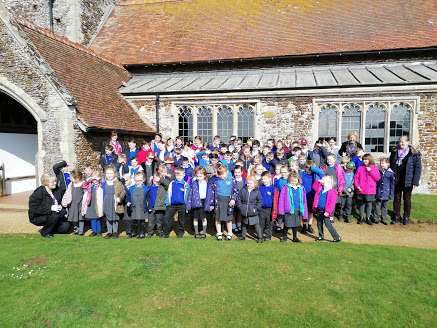 Sandringham and West Newton school held their annual Mothering service at West Newton church on the 29th March. It was a lovely sunny morning. After a short service in church everybody went outside for the clypping of the church. This is a medieval custom at which everyone holds hands and makes a loop around the church in order to show our love and respect for mother church. With parents and staff members as well as the children, we were easily able to completely surround the church! we then have 3 cheers for the church. The service finishes with prayers in the churchyard. Flitcham school did their service on 28th March. Sadly, they weren't so blessed with sunny weather. Flitcham church is much larger so it was a real stretch but we managed it there as well!